Status: offline Don't think bitmaps are an acceptable image download for the forums. Gifs, jpgs, txt, and zips only. 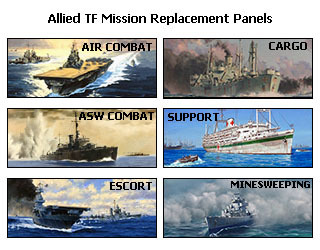 Status: offline I've been customizing my Allied Mission Panels and thought I'd share a few with everyone. Special thanks to Halsey for providing a great selection of new panels as well as the inspiration to try creating a few myself! I've been customizing my Allied Mission Panels and thought I'd share a few with everyone. Ground Unit panels can be modded in a similar way also. Maybe someday I'll have Mission, and Unit art panels corresponding to a yearly timeline. That sounds like a great idea and could be a subtle way to imbue some additional historical narrative into the game. In fact, it reminded me of an image I came across while searching for source images for my mission panel mods. I was considering it for the Allied support panel, but actually decided against it because I felt it was too period specific, especially when considering the connotations inherent in it. Of course, it is the Vestal parked next to the Arizona. Not exactly the image I want to see again and again while in the middle of an island hopping campaign in '44, but it could set the tone perfectly in '41. Status: offline I did some experimenting with the in-game flags this morning to help correct something that has been bugging me - the DEI has been tricking me into thinking I'm color blind. To me, the famous Dutch 'Oranje' has on the in-game flag has looked a bit too... black. So I decided to inject some new life into the flags - and what a difference! Color perception/preference is a highly subjective field (and depends on monitor type, color calibration, etc. etc. ), but I'd be curious to see what others think. I've attached my modified flag art as a zip file below. Just drop into your game ART folder, and you're good to go (but first make backups of the originals in case you don't like the new look ). Also, as a disclaimer I'm pretty sure that my 'old' flag files are mods themselves, so the true game originals could be just fine. I didn't modify all the flags as I felt some were just fine (if it's not broken, don't fix it!). In addition, I stumbled onto a neat interface improvement along the way. Once I decided that I was keeping the new flags, I knew I would need to update the flags with the supply warnings/indicators. But I noticed keeping the 'old' flags with the indicators helps visually differentiate the bases that warrant attention, as it sometimes can be easy to miss the thin exclamation marks on a cursory scan of a region. The darker flag even abstracts to the "power being out" (or soon to be). Status: offline I've made some additional tweaks/additions to my Allied Mission art; attached is my current A_Mission.bmp file for anyone to use. It is a combination of Halsey's and my own work. I've made some additional tweaks/additions to my Allied Mission art; attached is my current A_Mission.bmp file for anyone to use. It is a combination of Halsey's and my own work. I've updated it a bit, with new Replenishment and Amphibious panels, as well as, an improved Air Transport panel. I have installed again the game after a couple of years playing other options (but as usual I come back to the "king") and I was wondering if you can help me to find a good art pack. for ships, airplanes, etc. There are others, but they are scattered. Maybe others will post their links. Status: offline I present my Yorktown Class ART Mod v1. My intent with this minor mod is to enhance the frequency and structural accuracy of visual feedback for the Yorktown class upgrades. I for one find it gratifying to see the enhancements resulting from patiently waiting for an in-demand vessel to complete refitting! Shows the new SC-2 AS and SG SS radars, as well as the 40mm Bofors added to the bow and stern. The crane is visibly changed and some of the aft hangar deck side doors are opened. Shows the addition of the SK AS radar. A possible change I have in mind is to make another image side/shil for the 7/42 upgrade when the class upgrades from the CXAM type to SC type radars. Is it as simple as changing the assigned bitmap value in the Editor? Would modifying a scenario file disrupt any ongoing games if all I'm adding is new art to existing ships in the database? If adding art is fairly straightforward, there are other ship classes I'm interested in tweaking. I've spotted a ship with radar visually installed before the class is fitted with any, as well as have noticed there is no visual difference between the long and short hull versions of the Essex class. Credit goes to The Shipping Channel for the source line art, as well as the great in-game art that I used for reference. Edit: Consider this a 'prototype' - I discovered issues with this version that I will address in v2. Status: offline Here's a first shot at correcting version 1. I've only completed the 1st image set as there was a lot to fix. As I found better reference images it became apparent that my previous attempt left a lot to be desired. The bow protruded was too far in front of the flight deck, there was was too much open space immediately behind the bow, and the island's antennas could best be described as some sort of mismash of different radar types. I believe the HF antennas along the perimeter of the flight deck were only added later as well. I also made the gun wells forward of the island as well as the Mk 33 directors more distinct. The rest involved some shading on the hangar bay level to give the ship some more depth. Here's a close-up reference picture of an incredibly detailed model. Does anyone know what the ?? antenna is? 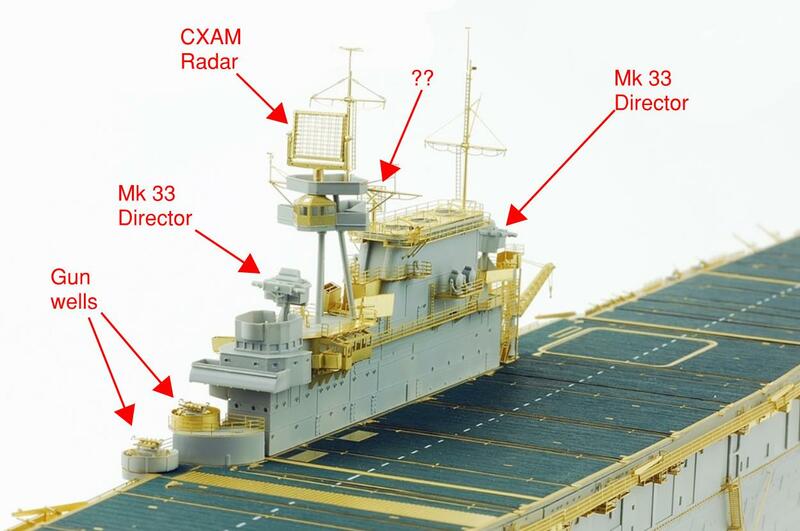 Is that an SC-1 radar co-installed with CXAM? I feel like a fool for having missed all these new art mods for the past few years. After installing the new TopoMap I came here looking to see what else there was and wow am I shocked! The rotating aircraft art data is an awesome feature. I didn't see the new bombardment screens on Halsey's website, are they located there and I just missed them or somewhere else? Thanks to everyone for continuing to work on this game after all these years. Not enough room for these on the site, and not enough demand. So I'm sorry to say that these are now unavailable. I really like those bombardment screens. Any still have them and can kindly upload them? Thanks! Status: offline Here is my latest ground units art file - I've been tweaking others' designs over time and have slowly been adding my own art. The overall idea is to be able to instantly recognize the unit type and country of origin just by looking at the picture. It's still a work in progress. The file is too large to upload, but if you right-click and save the image below as a .gif file, it might work. The key is to save it with 24-bit (8-bit per channel) colors, if at all possible. Status: offline Question for you art gurus. If I have the ship art but its not on the side/shil is there an easy way of putting it on those. IE I have the ship below done by Gary Childress. Is there a way I can put it onto a side or shil without recreating the ship? The best place for ship art assets (backgrounds) is Big B's Shipyard Work Bench. I think most people who do art regularly develop their own templates over time to speed up the process. You'll need access to an image editing application that can do layers and can save 24-bit bitmaps (8 bits per color channel). I use Photoshop myself. Status: offline Here's an update to my Allied mission art - the cargo mission art has been improved. BMP file attached as a .zip. Status: offline Korvar: Thanks I am trying to see if I can't do it on Paint 3D. If not I may have to break down and buy photoshop and learn how to do it. Status: offline I believe others have successfully used Krita - it's a free alternative to Photoshop. Give it a try! Status: offline GIMP is another alternative. Not as intuitive as PS, but quite good. GIMP is another alternative. Not as intuitive as PS, but quite good. They've made some major changes to improve it's ease of use lately but I have not tried it for myself in a while so can't say how much better it is now. Status: offline Hi guys sorry for bring up an old topic but have downloaded all of Halsey's artwork and it's amazing but I have just a small question if anyone knows I don't understand what Halsey means exactly with what he says here? F. IJNAF CV Grey and Green zips are manual JapPatch folder overwrites. Unzip and overwrite at named date to appear in game without renaming the ALT bitmaps. I cannot seem to get these art files to work when downloaded and overwriting with these two files. Can anyone help or have any idea how to get them to show correctly? Hi guys sorry for bring up an old topic but have downloaded all of Halsey's artwork and it's amazing but I have just a small question if anyone knows I don't understand what Halsey means exactly with what he says here? The Green Version is for Japanese Carrier AC insignia only, it should be zipped on 8/42 to JapPatch folder. It overwrites the Grey insignia. The Gray version is what the AC insignia starts as, it is here to overwrite the Green if you want to keep the vanilla mod insignia instead. To make the alt bitmaps appear you would have to rename each one, this zip skips that and just overwrites the regular ones. So I added these separately so they don't need to be renamed. Status: offline I've moved all my art for the game to here, so old things that were on mediafire (combat screens) or in attachments can now be found in one place. I think the link in the other Scenario / Art thread is outdated too so I'm linking my collection of files below. A few things have been updated like a new small clouds mod. Also.. if anyone can help me, I'm trying to find some original cathartes plane tops to help expand Japanese plane rotating art. In the image below are a number of sides for Zeros, Claudes and Nates. Those with no top.. are missing a corresponding plane top. The others are fine and are either from the default files or using modded tops. I think they are correct and i've set rotating dates for a couple. I'm looking for the original tops for those few that are missing. Edit: found the dappled A6M3 top.. Status: offline Any word on this? Even just releasing the source code so someone else could work on it would be wonderful.